bizSAFE is a programme launched by the WSH Council to assist Small and Medium Enterprises (SMEs) build up their workplace safety and health capabilities. It provides a systematic approach to help SMEs progress, from top management demonstrating their commitment towards WSH, to acquiring risk management (RM) and WSH management system capabilities. In the process, participating SMEs gained recognition and reaped the benefits of having a comprehensive WSH system in place. There are five levels in the bizSAFE programme, starting from Level 1 which is aimed at securing top management’s commitment to prioritising and establishing WSH as a key corporate policy. It recognises that without the drive and commitment of top management, the importance of WSH would be overlooked. To move on to Level 2, the enterprise must appoint and train a RM champion in-house to identify hazards, evaluate risks and implement control measures. bizSAFE Level 3 will require the enterprise to fully implement the RM Plan. To obtain Level 4 recognition, the company must appoint and train a WSH Management System champion to develop and implement the WSH system in the company. To reach Level 5 or bizSAFE Star level, the company must engage an independent third party certification company to certify that its WSH Management System meets SS506 or its equivalent. WSH is a key priority in the marine industry and a major focus area of ASMI. The Association plays an active role in promoting WSH to the marine industry. Loss of employee’s output due to injury or diseases will slow down productivity. An effective safety and health management system can reduce injuries, illnesses and their associated costs, such as medical expenses, employee’s injury compensation, additional manpower cost for covering lost time, etc. Hence it makes good business sense to invest in a workplace safety and health (WSH) management system. In 2007 the WSH Council launched the national bizSAFE programme to help small and medium enterprises (SMEs) build capability in managing safety and health risks. This initiative utilises a five-step programme which progressively builds the capability of companies in managing WSH risks. The programme also acknowledges companies’ WSH efforts through a certification programme. Since its inception, bizSAFE has attracted more than 19,400 companies which recognise the value in having WSH risk management capability. bizSAFE adopts a top-down approach where top management of companies attend a half-day workshop to embark on their bizSAFE journey (bizSAFE Level 1). The 2013 bizSAFE perception survey1, conducted by WSH Institute, revealed that management staff of bizSAFE Enterprises demonstrated greater involvement and commitment towards WSH by attending WSH meetings, monitoring companies’ WSH performance and setting WSH targets. This suggested that involving top management from the beginning of the bizSAFE certification made a difference in driving changes within the company. When a company progresses to bizSAFE Level 3, its risk management plan would be implemented and audited. The survey showed that more bizSAFE Enterprises were aware of the safety and health risks at their workplaces and involved their employees in risk assessment process. Based on the employees’ perspective, the findings also suggested that bizSAFE certified companies had better WSH practices and programmes in place, such as having reward systems to recognise good WSH practices. Almost 9 out of 10 companies that had engaged bizSAFE Enterprises found them to have better safety and health management and thus preferred to continue to engage bizSAFE certified companies for future projects. About two-thirds of them also indicated willingness to pay more to engage bizSAFE Enterprises. The findings implied that bizSAFE certification fostered more business opportunities and built rapport between companies that believed in having capability to manage WSH risks. The bizSAFE evaluation study concluded that bizSAFE helped improve companies’ safety and health through creating a greater level of awareness of, better management of WSH risks, and a stronger commitment towards WSH. bizSAFE certification is also valued among like-minded companies that understand having an effective safety and health management system makes good business sense. For more information on bizSAFE programme, visit www.wshc.sg or email to bizSAFE@wshc.sg. 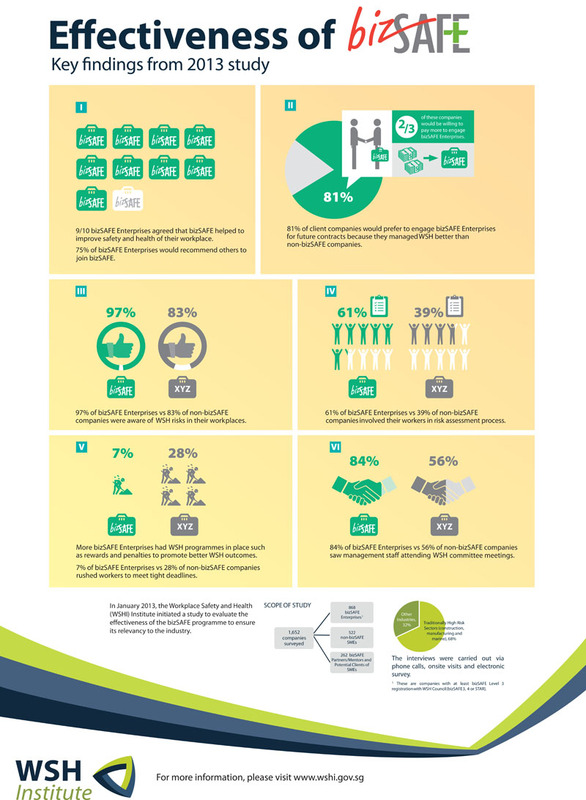 The key findings on the evaluation of bizSAFE programme are available at www.wsh-institute.sg. 1 The study interviewed 1,652 companies for those with bizSAFE Level 3 certification or higher (a.k.a. bizSAFE Enterprises), those without bizSAFE certification as well as potential clients of SMEs to evaluate the business value of bizSAFE certification. This article is courtesy of WSH Council. Graphic courtesy of WSH Institute. Below is an extracted listing of marine and offshore engineering enterprises who have attained bizSAFE Level 3 and Star certification presented by the Workplace Safety & Health Council. A STAR TECHNICAL SERVICES PTE. LTD.
A. K. LEE ENTERPRISES PTE. LTD.
ADS TECH ENGINEERING PTE. LTD.
AFLEX SHIPS EQUIPMENT PTE. LTD.
AFLOAT MARINE & SERVICES PTE. LTD.
ALTUS MARINE ENGINEERING PTE. LTD.
ANGELINE MARINE SCAFFOLDING PTE. LTD.
ANTZ MARINE SERVICES PTE. LTD.
APEX MARINE SERVICES PTE. LTD.
APEX OFFSHORE SERVICES PTE. LTD.
BANYAN MARINE (S) PTE. LTD.
BBN INDUSTRIES (S) PTE. LTD.
BEMO MMP RAIL SYSTEMS PTE. LTD.
BERGEN MARINE AND OFFSHORE PTE. LTD.
BEST MARINE WORKS PTE. LTD.
BESTEC MARINE ENGINEERING PTE. LTD.
BESTEC OFFSHORE & ENGINEERING PTE. LTD.
BETSY OFFSHORE SERVICES PTE. LTD.
BIG-FOOT INTERNATIONAL (S) PTE. LTD.
BLUE VEL MARINE PTE. LTD.
BLUE WHALE MARINE CONSTRUCTION PTE. LTD.
BLUEWAVES ENGINEERING & GENERAL SERVICES PTE. LTD. BRIGHT ASIA ENGINEERING PTE. LTD.
CHYE JOO MARINE PTE. LTD.
CHYE SEN MARINE & YACHT SERVICES PTE. LTD.
COMMERCIAL DIVING SERVICES (SINGAPORE) PTE. LTD.
CONSOLIDATED PIPE CARRIERS PTE. LTD.
CREST SUBSEA INTERNATIONAL PTE. LTD.
CRESTSA MARINE & OFFSHORE PTE. LTD.
CROSSROADS MARINE SERVICES PTE. LTD.
CSL MARINE ASIA PTE. LTD.
DALLAS MARINE & ENGINEERING (S) PTE. LTD.
DIVE-MARINE NDT INSPECTIONS PTE. LTD.
DIVE-MARINE SERVICES (PTE. ) LTD.
DX MARINE SERVICES PTE. LTD. DYNAMIC MARINE & OFFSHORE PTE. LTD.
E7 ENGINEERING (S) PTE. LTD.
EMS ENERGY SOLUTIONS PTE. LTD.
ESSAR INTERNATIONAL (S) PTE. LTD. ET MARINE SERVICES PTE. LTD.
EUGENE MARINE INTERIORS PTE. LTD.
EVERTECH MARINE AUTOMATION SERVICE PTE. LTD.
FUTURE ELITE MARINE & OFFSHORE PTE. LTD.
G & K ELECTRICAL PTE. LTD.
G & K MARINE & INDUSTRIAL ENGINEERING PTE. LTD. GLOBAL MARINE & INDUSTRY PTE. LTD. GLOBAL OFFSHORE HYDRAULIC PTE. LTD. GLOBAL TECH MARINE SERVICES PTE. LTD.
GLOBE DENKI MARINE PTE. LTD.
GREAT ASIAN ENGINEERING PTE. LTD.
� 2018 Association Of Singapore Marine Industries. All Rights Reserved.